You are here: Home / Grange Notes / Digesting at the Grange–first muffins, now Blockchain? Digesting at the Grange–first muffins, now Blockchain? Our annual Baking Contest brings out the good stuff. Entrants in our 2018 Grange Baking Contest presented our judges with many choices, in a wide range of muffin types and tastes. Entries included muffins with toppings, muffins with glazes, muffins with spices, muffins with applesauce, muffins with yeast and various combinations of them! It was a clinic in the variety adventurous bakers can create, when given “use your own apple muffin recipe” as the only guideline. Our panel of judges was smaller than we expected, pairing Lynn Spencer, the Berlin Elementary Art teacher who judged cinnamon rolls for us last year, and last-minute “pinch eater” Viveka Fox, who has often enlivened our stage as a fiddler and bodhran musician with Atlantic Crossing and Frost and Fire. She came to dance on April 7th, but was quite willing to judge muffins! Lynn & Viveka developed a testing protocol, did some careful division of muffins, and…came up with winners! Blue Ribbon went to Sascha Gerschfeld, who came to the Grange meeting for the first time, and went home with prizes…and a membership to our Grange! Red Ribbon went to Erin Barry, organizer of the popular Kids Trade ‘n’ Play monthly clothing and toy exchange at our Hall. Green Ribbon went to our Vice President, Phyllis Skinner, who brings delicious desserts to our potluck dinners, as well as educating us on health issues at every meeting. Congratulations to Sascha, who will repeat her winning recipe at the Grange Center in June, competing for the Vermont State Grange championship, and to Erin & Phyllis. Thanks to our judges, and to the potluck dinner attendees who selflessly disposed of the remaining muffins. Speaking for myself, I had only heard of “Blockchain technology” in connection with Bitcoin, one of those financial/computer ideas that has popped up in the news occasionally over the last several years. As a conservative in my finances, I have never been tempted by investment fads and bubbles, so I haven’t paid much attention. Imagine my surprise when I heard that the VT Legislature passed a law in 2017 recognizing Blockchain technology as a way to “authenticate artwork and precious stones”, and that a bill is being considered this year to use the same technology to protect state and private data. Since the CCG is encouraging civic involvement in the communities of which we are a part, we have asked Jeremy Hansen, who is a professor of computer science at Norwich University, as well as being a Berlin Selectboard member and the organizer of Central VT Internet, to give us a brief and non-technical introduction. Join us about 5:30 PM on this coming Saturday, May 5th, to learn more about how this seemingly esoteric technology could help Vermont to safeguard data and increase confidence in electronic transactions. Remember, you can chew these ideas over at the Community Potluck right after the program! And after the meeting–it’s the monthly Community Potluck. Join your friends bring your neighbors–there is always good food! All are welcome, whether you are a member or not. Bring something to share–amain dish, a side dish, meat, vegetables, a dessert, some chips, somebread, some cheese, some juice–we will eat (almost) anything! We start about 6:00, and will need to make space for the soundcheck for the contra dance band which will be playing for the CDU dance at 8:00. Please stay for that as well, if you’d like–there will be an admission fee. On this night, the caller will be Sue Rosen, and the band will be Ethan Hazard-Watkins & Bob Rosen. A great time will be had by all! There’s a newcomer’s workshop at 7:30 if you’d like to try it out. Many of those who read the Grange Notes will recognize these familiar figures–Lewis and Maudean Neill have been part of the Grange community for a loooooooong time! Part of the backbone of the Montpelier Church of Christ which has met at the Grange Hall for decades, the Neills have worked closely with the Grange for years as well. Lewis set up ladders and scaffolding when the Contra Dance Umbrella organized painting of the Grange Hall in the late 1990s, mowed the edges of the parking lot for years, put in the “new” culvert under the driveway (by himself! ), installed LED emergency lights…the list goes on. Maudean, who sends out the Church bulletin every week, has put in time on the Grange flower beds, and along with Lewis is a mainstay of the Berlin Historical Society. In 1989, she researched and wrote a book about the KKK’s activities in Vermont–check this VT Digger article for more info! 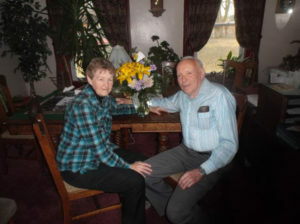 The Neills invited their many friends and family to their home on Wednesday, April 25th for a 65th wedding anniversary get-together. Merry and I were honored to be invited, and enjoyed meeting many children, grand-children and great-grandchildren, as well as acquaintances and friends. Congratulations on a long, warm, giving and productive partnership! Also at the April 7th meeting, the Grange members voted unanimously to pledge a $5,000 contribution to the Friends of the Capital City Grange Hall, to support the next upcoming major project at the Hall. The basement renovations are designed to save us money on heating, make the walls and ceiling brighter, protect us against water leakage and make the floor warmer and more comfortable. This support by the Grange is part of the Grant Application which was submitted Sunday April 29th, by the team from the FCCGH–many thanks to Nancy Turner, Patty Giavara, Joanne Garton (and yours truly), who put together the research, plans, quotes, budgets, support letters, and much more to allow us to apply. The Vermont Arts Council administers the “Facilities Improvements” grant program, which gives matching funds to non-profit organizations like ours, which provide performance/display/creation spaces, and promote the arts in Vermont. We won’t hear until August 1st whether the Friends get the approval. Many thanks also to the many Grange members and friends who have contributed their knowledge, opinions and money to the FCCGH–we have to raise half of the project cost (estimated to be about $55,000) ourselves, to match the 50% of that which the Arts Council grant could potentially provide. People who have given donations to the Friends and the Grange over the years have helped to fund over $102,000 of improvements to the Grange Hall, including the new entrance and ADA bathroom in 2008, before the Friends were incorporated! The Friends will need to ask for more financial help to get this project done, even if we get the grant, but the Grange and the Friends are confident that we can make this next investment happen, and that it will pay off. If you want to make a tax-deductible contribution, just click theDONATE button on the Grange website. Also at our meeting in April, we heard from the “new neighbor”, Greg Western, who purchased the property behind the Grange Hall last year. 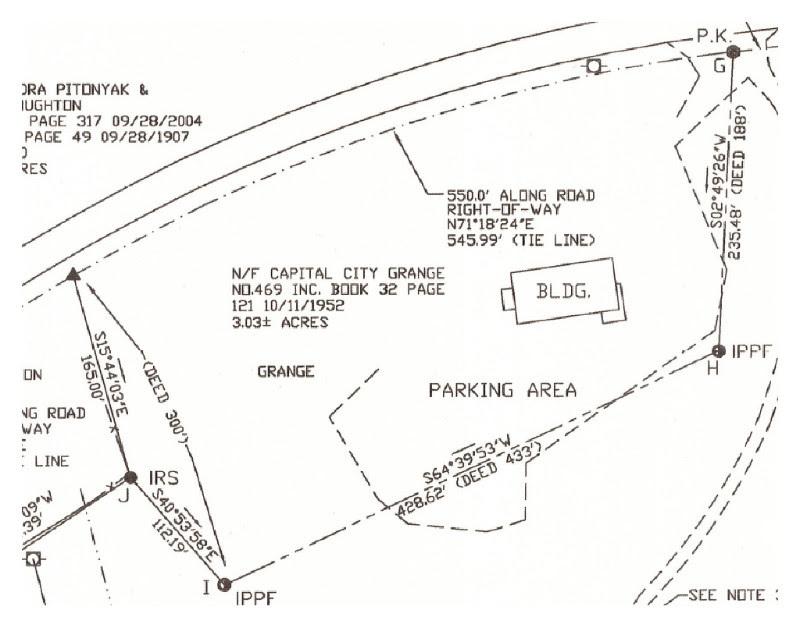 In the process of doing a survey of the property lines for the purchase, the surveyor found that the back line of the Grange’s lot actually cuts off part of the parking lot–see the map below. 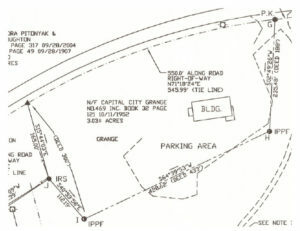 acknowledge the legal property line as matching the surveyed ones. agree that the Grange can continue to use the parking area as long as the property is owned by the Grange or a non-profit community successor organization. The Grange members at the meeting agreed unanimously that we should proceed with this process, and agree to it if the documents are correctly drawn up. I expect to hear from Greg’s lawyer soon, and will have the deeds to check over, show to legal advisers, and sign if all seems in order. 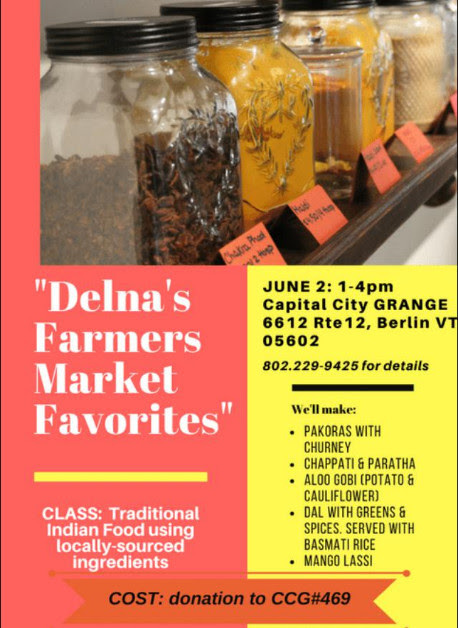 Coming in June: an Indian cooking workshop! One of the people who attended the (delicious) baking workshop in March was Delna Boyce, a Northfield resident. 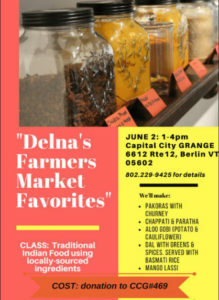 As an accomplished cook, she immediately saw the opportunity to use the Grange’s facilities as a way to share her knowledge of Indian food with Grange & community members. Merry has been working with her to set up the workshop described in the poster below. Save the date! Just in case you want to re-read any of the information in these Grange Notes, or if you want to check the predictions I may have made against the realities–these Notes are archived on the Grange website: click the Grange Notes button at the top of the page. Many thanks to dedicated Grange volunteer Tova Cohen, who makes sure this happens every time. Remember, you can comment on the website as well–and I’ll be happy to get articles contributed to the Notes–I know there are other ideas and viewpoints out there!